Thank you to Eclipse Awards for sponsoring our beautiful sustainable handcrafted awards. Also thank you to Hapa Izakaya, La Mezcaleria, The Naam, Skoah, Nikkei National Museum and Cultural Centre, dutil. Denim Shop and Scandinazn for contributing to our silent auction. More to be announced soon! In addition to our September Festival, we provided vibrant programming with a focus on mixed heritage throughout the year. FREE screening at the 2017 Powell Street Festival! Curated by Hapa-palooza co-founder and award-winning filmmaker, Jeff Chiba Stearns, Hapa-palooza is proud to co-present this year’s Mixed Flicks screening of ALMOST ASIAN at the Powell Street Festival. 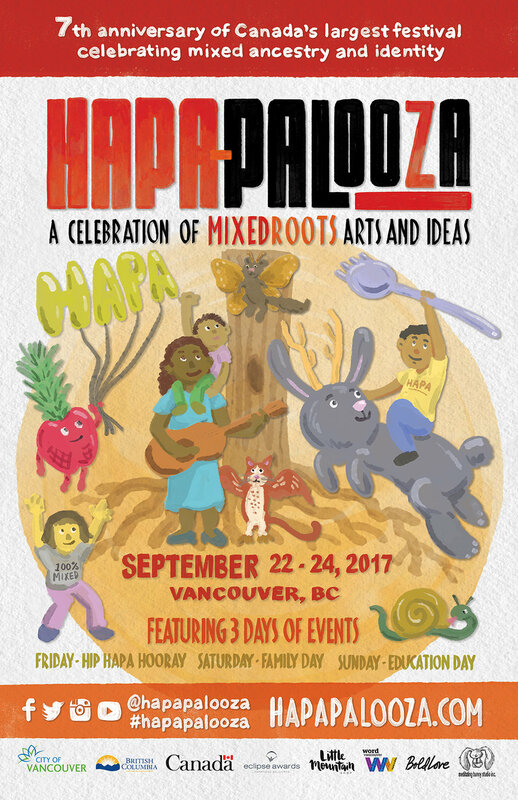 Award winning short film screening at the Firehall Arts Centre, co-presented with the Hapa-palooza Festival. Curated by Hapa-palooza co-founder and award-winning filmmaker, Jeff Chiba Stearns, Hapa-palooza is proud to co-present this year’s Mixed Flicks screenings of the short films, BORN WITH IT and BLASIAN NARRATIVES at the 2017 Powell Street Festival. This program of short films looks at the mixed Japanese and Black experience both in Japan and North America. The award-winning short film, BORN WITH IT, directed by Emmanuel Osei-Kuffour, tells the story of a 6-year-old sheltered African-Japanese boy who goes on a search to find out why his skin is darker than his new Japanese classmates. BLASIAN NARRATIVES is a multi-media “Docu-Theatre” project that intimately explores the intersection and identities of mixed race Black & Asian individuals through live performances and film. 40 minutes. Artists and storytellers in this year's line-up include Zarah Martz, Tarun Nayar, Fred Wah, Melissa West Morrison, Amal Rana, and Henry Young, amongst others, all with unique and important perspectives on the theme of "Stories That Shape Us."